For last week’s Visual Vocabulary I focused on a crucial element in graphic recording: the arrow. Within any visual display of information, arrows guide our eyes from one idea to the next. When used effectively, they can do much more than that. Rather than just showing that one idea is connected to another, arrows can also reveal the way in which those two ideas are related. Over the past few months I have developed a set of arrows that I use regularly and fairly consistently in my own sketchnoting. Bellow you will find arrows with the following titles: conceptual-related big idea, conceptually-related detail, following a path, therefore, and timeline. 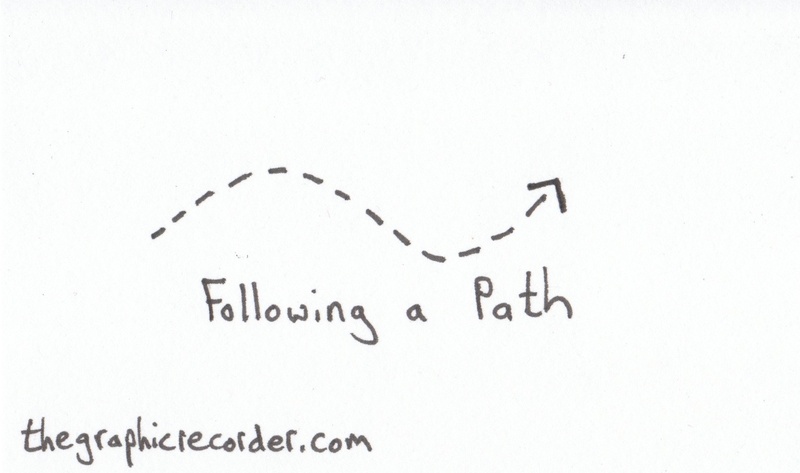 Read on to see these arrows and learn how I use them in the context of a complete sketch. 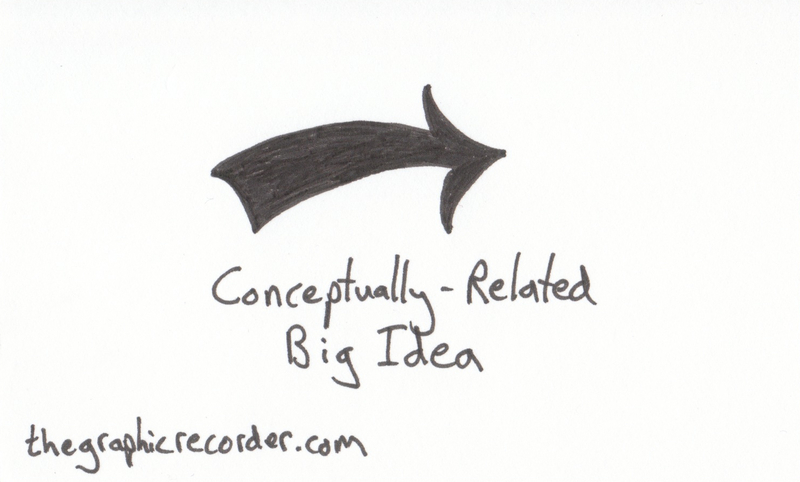 The conceptually-related big idea arrow shown above is by far my favorite, largely because I enjoy drawing it, but also because it looks great. I use this arrow in just about every sketch. Here is just one example: in a sketch that captures the ideas from one chapter of a book, I used this arrow to connect the central motivation of the text to each big idea from that chapter. This second arrow is similar in purpose but smaller in scope. 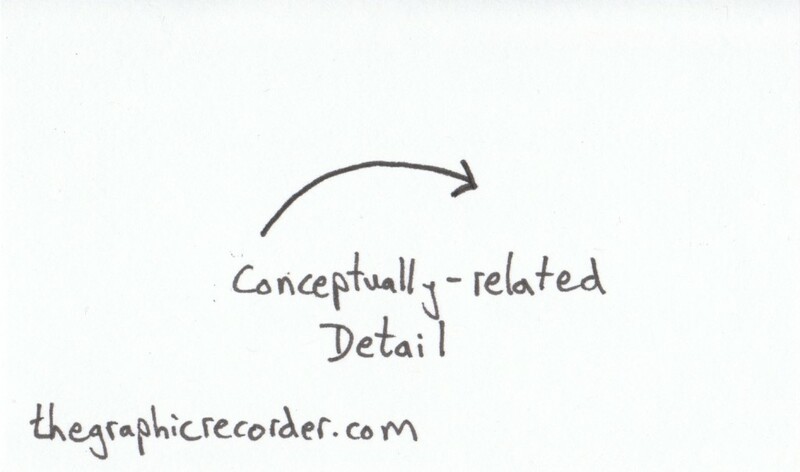 I use the conceptually-related detail arrow to link one big idea to a particular detail that is related to that idea. 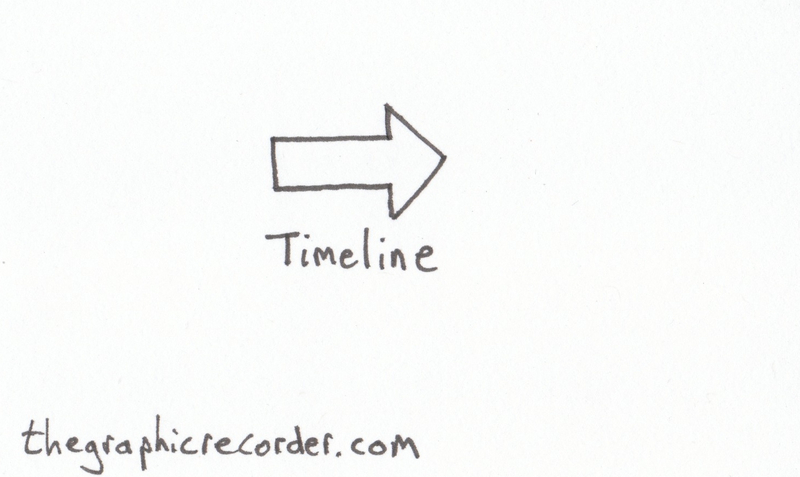 In a recent sketchnote of a Fresh Air podcast, I used both this detail-oriented arrow as well as the big picture arrow within a single topic. Notice the upper left portion of that sketch which depicts the role of AQAP (Al-Qaeda in the Arabian Peninsula) in Yemen. This third arrow, titled following a path, is likely self-explanatory. In this sketchnote from the Model Thinking course I used it to demonstrate the variety of paths that you can take within the course. Check out the “Outline and Structure” portion of the sketch to see how I did that. I use the arrow above in sketchnotes as I would the word therefore in writing. 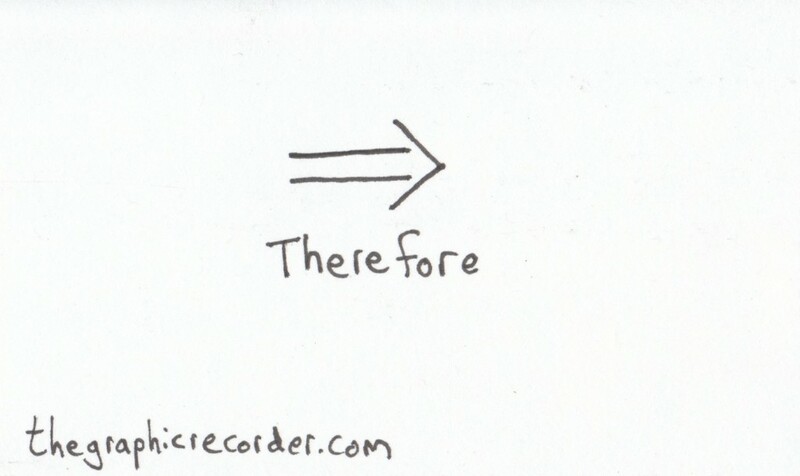 It can also have the meaning of “which leads to,” as in this sketch that talks about correlation and causation. The last in this set is the timeline arrow. I use it to communicate a series of events. For an example we return to the model thinking sketchnotes. Notice the arrows used in the “Section Structure” portion of the sketch. That portion alone incorporates three (or at least two and a half) of the five arrows that I’ve talked about today. Can you spot them all? Is there an arrow style that you like and use that didn’t make this first set? If so, let me know about it in the comments below! The sketches seen here are part of a project called Visual Vocabulary. In addition to helping me build my own visual vocabulary, my hope is that these small sketches might serve as a resource for others who are new to visual note taking and are trying to develop their skills. The theme for this next week of visual vocab: Delicious Drinks. If you want to check out even more resources, then head over to the Visual Note Taking Resources page.